I am a big fan of cheesecake. 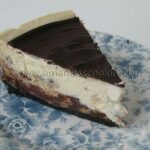 I already have several cheesecake recipes on this blog, but there are so many more out there to try I know I’m nowhere near finished! I even have an entire cookbook dedicated just to cheesecakes. Traditionally cheesecakes are made with cream cheese, but there are recipes out there using Neufchatel, ricotta and even cottage cheese! So I ventured outside of my comfort zone and tried this beauty. Because this recipe uses ricotta cheese, the texture is different and not as creamy as your standard cheesecake. However, there is no skimp on flavor and putting it together was a snap. The fine folks over at Sargento asked me to try one of their cheesecake recipes, so I chose their Chocolate Chip Cheesecake. You know me, I did make a few adaptations, but not too many. I kept the ingredient list pretty much the same and just changed the method a little. In fact, because I did, that could have been why I ended up with such a large crack in the top. I’d never made a cheesecake with ricotta before, so perhaps using the food processor broke up the molecular structure of the cheese too much? Who knows, I’m not a kitchen scientist and it’s nothing a little topping won’t hide. :) It definitely didn’t affect the flavor though and everyone enjoyed it. And let’s see if you really read my posts.. if you are wondering why I photographed the cheesecake off to the side it’s because I accidentally knocked my white board down on top of the cheesecake causing a big mess on one side. Ha! Making cheesecake with ricotta cheese is a lower calorie way to enjoy your sweets! Lightly grease bottom and sides of 9-inch springform pan. Combine crust ingredients in small bowl. Press evenly over bottom of pan. Bake in preheated 350°F oven 10 minutes. Combine Ricotta cheese, sugar, half-and-half, flour, vanilla and salt in the bowl of a food processor. Process until well combined. Add eggs, one at a time, pulsing processor until smooth. Fold in the chocolate chips; pour over crust. Bake in preheated 350°F oven 1 hour or until set. Remove from oven to wire rack but leave the oven on. Cool on rack for ten minutes. Meanwhile, combine sour cream, powdered sugar and vanilla until well combined. Spread on top of cheesecake and return to oven for 12 minutes. Cool on rack for 30 minutes. Refrigerate 1 hour then remove from fridge. Melt the chocolate and butter in microwave for one minute. Stir until smooth then spread over the top of the cheesecake. Refrigerate for at least four hours, overnight is best. Here’s what I changed – peanut butter puff cereal for the crust, did half ricotta and half cream cheese, for the topping I replaced 1/2 cup of sour cream with peanut butter – AMAZING! Baked it in a water bath so the top didn’t crack. Wow Danielle, I bet that was fantastic! I just made this for a New Years’ Eve party and it looks delicious! Mine didn’t crack at all – it came out beautifully. The only alteration I made was cutting the recipe in half to fit a 7″ springform pan. I love making cheesecake and Ricotta cheesecakes are delicious! This site helped me with making sure my cheesecake doesn’t crack. I can’t wait to try this recipe! Hope you enjoy it Mel!